As usual, the captain and crew invited the port authorities, the agent and government officials to attend a ceremony to celebrate the so-called ‘inaugural call’ being the first visit of the ship to Curaçao. 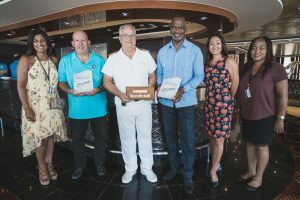 The ceremony includes the traditional exchange of placards taking place between the ship’s Captain and the representatives of the local port and in this case in the presence of Minister Steven Martina of Economic Development and also representative of the shipping agent Maduro Shipping, Mr. Albert Elens. 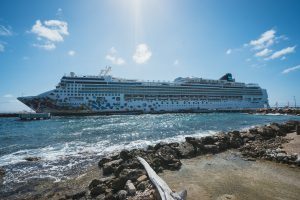 The Norwegian Gem left on December 2 for a 18-day cruise from New York, spent 3 days at sea and the first port to visit was Curaçao with 2233 passengers aboard. Then the trip continues to Aruba, 2 different ports in Colombia, Panama, Costa Rica, Nicaragua, Guatemala, 3 different ports in Mexico to end in Los Angeles. On the photo: During the delivery of placards the Captain of the ship, Minister of Economic Development Mr. Steven Martina and Mr. Albert Elens of Maduro Shipping. From left to right Ms. Constance Martina (wife of Minister Martina), Mr. Albert Elens (Director of Maduro Shipping), Captain Fafalios, Minister of Economic Development, Mr. Steven Martina, Ms. Sau Bridgewater-Chong (PR official of CPA) and Pharahien Pilgrim (Supervisor Shipping department of Maduro Shipping).